Aerospace engineers are brushing up on their knowledge of tooth enamel. It turns out that teeth and aircraft materials have something in common. Professor Herzl Chai of Tel Aviv University's School of Mechanical Engineering and his colleagues at National Institute of Standards and Technology and George Washington University have published research on how the structure of teeth holds useful clues for aerospace engineers. "Teeth are made from an extremely sophisticated composite material which reacts in an extraordinary way under pressure," says Prof. Chai. "Teeth exhibit graded mechanical properties and a cathedral-like geometry, and over time they develop a network of micro-cracks which help diffuse stress. This, and the tooth's built-in ability to heal the micro-cracks over time, prevents it from fracturing into large pieces when we eat hard food, like nuts." In teeth, fibers aren't arranged in a grid, but are "wavy" in structure. There are hierarchies of fibers and matrices arranged in several layers, unlike the single-thickness layers used in aircrafts. Under mechanical pressure, this architecture presents no clear path for the release of stress. Therefore, "tufts" — built-in micro cracks — absorb pressure in unison to prevent splits and major fractures. 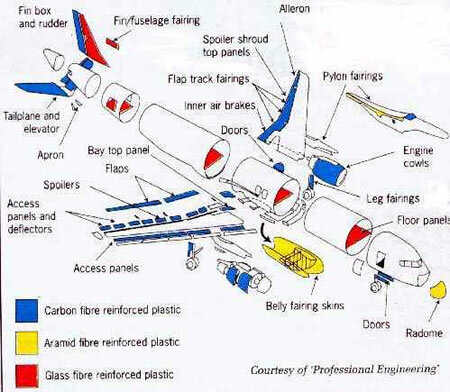 Aerospace engineers already use a variety of composite materials in the construction of aircraft. Composites consist of two or more materials (matrix and reinforcement) combined to give a material with properties distinct from the original constituents. They may be naturally occurring, or they may be synthetic. Although the use of composite materials is as old as engineering, science fiction writers have championed unusual ideas about the use of natural materials in the creation of sophisticated technological constructions. For example, in his 1989 novel Hyperion, Dan Simmons writes about mighty treeships that are used to travel between the stars. From Flying by the Skin of Our Teeth .